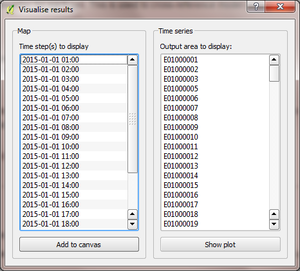 Visualising output A simple visualisation tool accompanies the model, which produces maps and time series plots of the most recent run by default. One plot per output area is produced for all of the time steps present in the model output directory, showing the three QF components on separate axes. To plot a time series, select the output area of interest and click the “Show” button. The naming convention used in the shapefile must be defined in the transport section of the Data sources file for the first three. Daily fuel consumption in an OA is converted to mean heat flux [W m-2] using the heat of combustion [J kg-1], number of seconds in a day and the area of the OA [m-2]. This is disaggregated to half-hour time steps using empirical diurnal cycle data for each day of the week. 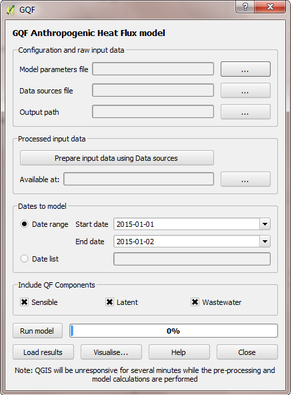 Parameters_file: Contains numerical values and assumptions used in model calculations. custom_holidays A list of custom public holidays in YYYY-mm-dd format. Minimum data Classification for every road segment that allows a default AADT and speed to be applied. Default values are specified in the parameters file. Information on road segment classifications Note: Any other classifications in the shapefile are treated as “other”: small local roads.